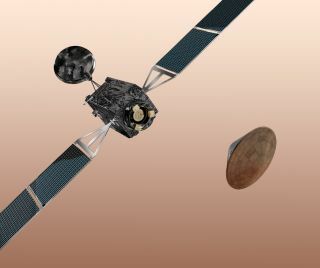 The ExoMars Trace Gas Orbiter and Schiaparelli, the Entry, Descent, and landing module, will search the Martian environment and atmosphere when they arrive in 2016. A future Mars landing module tasked with mapping the Red Planet will bear the name of the Earthling that did it first. It was Italian astronomer Giovanni Schiaparelli who first mapped the surface of Mars in the late 19th century, and when the European Space Agency's ExoMars module begins to map the Martian surface in 2016, it will be named in honor of its famed namesake. Schiaparelli is part of ExoMars, a series of missions by the ESA and Russia's Roscosmos space agency that will search for signs of past and present life on Mars while investigating the atmosphere and geochemical environment of the planet. The entry, descent and landing module, along with the Trace Gas Orbiter, will be the first to arrive in late 2016. When Schiaparelli arrives, it will enter the atmosphere at 13,000 mph (21,000 km/h), using parachutes and thrusters to decelerate over eight minutes, all while collecting data on the atmosphere. Once it touches down on the Meridiani Planum, a plain just south of the Martian equator where NASA's Opportunity Rover landed in 2004, the instruments will take measurements at the landing site. Schiaparelli will monitor the seasonal dust storms, which should be gearing up at its arrival. A second mission in 2018 will launch a rover, with a carrier and surface platform. The 2016 mission is scheduled to conclude in December 2022, allowing the two components to work together to investigate the Red Planet. Schiaparelli created detailed maps of the Red Planet when it reached its closest approach during its opposition in 1877. During this period, Schiaparelli mapped a network of linear structures which he dubbed "canali," Italian for "channels." However, the term was mistranslated into the English "canal," giving rise to the idea that the formations were created by intelligent life. Exploration of the planet by orbiters at the end of the 20th century revealed that the canals were optical illusions, likely streaks of dust caused by wind. However, the canals sparked the public imagination, appearing throughout science fiction and increasing the world's fascination with the Red Planet.